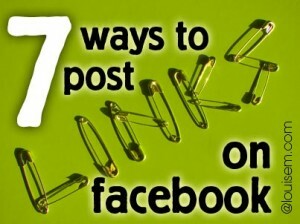 How many ways can you post a link on Facebook? Here are 7 ways! Why so many? I highly recommend that once you publish a post, you use your site’s Facebook button to “Like” it, and get the social proof rolling. The DiggDigg plugin that I use allows you to add a comment when you “Like,” which then posts with the link preview to your Facebook personal profile, and your FB friends’ news feeds. Try adding a conversation starter – as your friends respond, their friends will also become aware of your link post. You can check it out now by clicking the Like button in the floating sidebar at left! You have several options when posting a link on your Fan Page. The link will become clickable, and will also pull in an image and text from the linked page. Fan Page admins have been reporting that text-only status updates have been getting more reach for a few months now. So some are posting links without any preview at all. Simply follow the instructions under method 2 above, then click the X in the upper right of the link preview box to remove it. 5. Variation: Some companies are integrating arrows ( –> ) into their posts. They report that using an arrow to point to their link –> http://me.com/post-name works pretty well. Sort of a subtle call-to-action! NOTE: When posting text links, be aware that studies have shown shortened URLs have a lower CTR (click-thru rate) than full URLs, as many people are hesitant to click them. Recommended: use the full URL on Facebook so users know where they’re going when they click. See my post, How to Post a Link on Facebook to Get Noticed, for instructions. Some Fan Page admins report that this method gets the most engagement (Likes, comments, shares), but that the previous methods get more clicks to your website. Test the methods on your own Page and see! 7. Variation: Post your photo and status update, then add the link in the first comment. The only problem with this method: unless you have a small fan base, your link comment will quickly be buried. But worth a try – several Fan Pages recommend using this method, so it must work for them. I recommend trying at least of few of these, and checking your Facebook Insights to see which get the most engagement and/or clicks. Have you tried several of these, and found one that works best? Which ways will you try to post a link on Facebook? I’ve mostly used those too, Te! In fact my favorite is with a large photo. I have asked some of my business friends… Facebook blocks me from posting my link… within the same marketing company my peers are posting their link’s and not being charged by facebook. What links can I use to post that will not charge MA and reroute me to my link. …others in this business have sidestepped my question. ..which is a bit silly…I’m in there downline and they make money off of me…but thinking because they can see …they are also trying for my lead… do… a link that can be clicked…would be very helpful… I dI’d buy one from Google and it did reroute for 1 day, then it was,blocked… I debugged my link bit then it took me to a blog, which I would like to know how to use ..but didnt know how to reroute Mt link through the blog? ?? I hope you can understand. …buy I have tried reading up on it…and friends are not so easy to get info from!!! I don’t understand what you’re doing or experiencing. It sounds like you may be posting some type of an affiliate or redirect link, and FB doesn’t like it. Your best bet is to contact the company as they would have the most experience with this. One thing that works most times is if I copy/paste my blog link into Facebook. It’ll bring the picture and the preview. What I think I’ve discovered is if the picture is too big, the copy/paste will not bring the picture. I don’t think I’ve noticed that! I don’t usually do it that way on FB, so I may be thinking of other SM platforms where it will even try to bring in a big infographic! “URL” of the post in the area above the photo. Thanks James! Glad you enjoyed it. I don’t post many photos on Facebook. I do post my url for my blog posts and I can get an image to show for that. 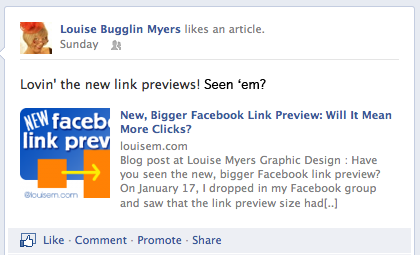 Thanks Louise, I do find that pages with a variety “styles” of posts are more attractive. I appreciate the “how to” and will try some of these out. Hi Liz, thanks for visiting! Hope you have some fun trying these out. Thanks Louise. I have heard that you can set up a business page on Facebook so that if you sell your business ( not the Facebook page) to can transfer the admin to the new owner. Is this correct? & do you have any info on this? I don’t know if Facebook has a policy on this, but it’s easy to do. Just add the new owner as an admin, and then they can delete you. I believe you can’t sell a FB Page, but it certainly seems the page should go to the new business owner! I sometimes do a bit.ly with the text when I have a page set up to go to twitter. Great tips and variations. Thanks. Great post. Thanks Sabrina, this post has become pretty popular! Hi, I’m hoping you can help me. I absolutely, positively *cannot* force FB to post an image from my WordPress.org website (either from my blog or one of my static pages) when I try to put a preview of that webpage on my wall. I’ve tried at least two versions of Open Graph plugins, and neither made the least bit of difference, even when I entered the image URL in the space provided. Can you help this non-techie with an *easy* way to get this done? Thanks! 1. your image size is too small. 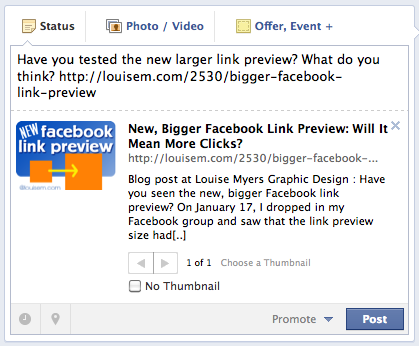 2. try the Facebook debugger linked in that post. If neither of those is the solution, you could try reaching out to the plugin makers for ideas. They’re likely more savvy than I! Wishing you luck with it! Don’t worry about any techy suggestions given there – usually just running your link thru the debugger will fix the problem. Have you found that to be helpful? Facebook has said it will suppress this type of post in the news feed. I haven’t heard of this before, but there must be something about your website – or the way you posted – they didn’t like. i don’t know why i can’t post links in groups. when i paste facebook doesn’t show any dialog box. I wouldn’t be surprised if FB identified you as a spammer, since you also left spammy comments on my site. I don’t allow keywords as names or deep linking. Your link has been removed and your name edited. I would like to post a HTML hyperlink in to my FB Group like this “My Text” where I like to show only my “My Text” to my viewers. After post this HTML hyperlink it doesn’t work. Full HTML code goes to post. Would you please tell me what is the mistake? Facebook doesn’t support user HTML. Thanks for sharing Louise, Yes, facebook can’t support HTML so I use to post a link on facebook or post a photo and paste a link. Both work, the second seems to get a lot more reach. I hope this is helpful and effective thank you so much! Try them out and see what works best! Awesome Post. The Number 4 method is my favourite one because it attracts users attention. You could try the FB debugger here. Very helpful post. I usually post link o my business page and i have joined serval communities I share the post there directly on my page and it is also helpful and easy. Two common problems are 1. image too small 2. no open graph data. You may need a tech person to help for the second one. I tried to follow three points and I got succeeded. Now I can paste my URL on facebook. Please add more post on a regular basis so that we can get more pieces of information. I followed all your points in my website, thank you for the feed. really i am impressed after read your content.